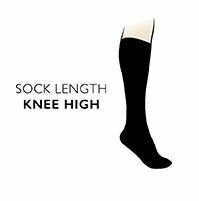 With a delicate pattern and ajour-effect floral lace leg, Falke Romance Pelerine Cotton Knee High Socks bring style cues from a bygone age right up to date for A/W 2017/18. The sleek, smooth mercerised cotton rich blend allows the weave to be fine, light and non-bulky, keeping legs looking slim. The lace pelerine pattern comes to a ‘V’ at either side of the ankle (as it also does at the deep cuff) giving way to a more comfortable plain weave for the foot area that includes the best hand linked toes for smooth seams. The style is also available as an ankle sock.